HALA GORANI, CNN INTERNATIONAL ANCHOR (voice-over): Thousands marched through Basra, calling for direct elections in Iraq. The Iraqi rally, a response to a demand to Iraq’s foremost Shiite cleric that the National Assembly be elected, and to his criticism the coalition’s plan for governance won’t work. UNIDENTIFIED MALE: We felt that what is being proposed now as an alternative to elections is not good enough. And therefore, should be improved. I agree with them. I think there is room for improvement. PAUL BREMER, U.S. CIVIL ADMINISTRATOR IN IRAQ: It will take a time to produce an electoral law, to get a political parties law, draw constituency boundaries, to take a census so we can have a voters’ list. These things are – really cannot be done in an appropriate fashion between now and when the Iraqi people want their sovereignty back, which is the end of June. UNIDENTIFIED FEMALE: In a democracy, majority rules, and the majority in Iraqi is Shiite. And so, no one should be surprised if the leadership is heavily (UNINTELLIGIBLE) or dominated by Shiite politicians. UNIDENTIFIED MALE: What the United States is going to insist upon is saying, yes, we should have majority rule, but (UNINTELLIGIBLE) minority rights. GORANI: On this edition of Q&A, Iraq, religion and politics. GORANI: Welcome to Q&A. Rallies in Iraq for elections. You saw them there. They want them to be popular, and they want them to be free. The demonstrations came after a Shiite cleric Grand Ayatollah Ali Al-Sistani called for members of the National Assembly to be elected directly, as opposed to the U.S. plan that would see members selected from regional bodies. Rallies were held in the southern city of Basra, but they have resonated with Shias throughout Iraq. Is this the beginning of a clash of politics versus religion? With their views, from San Francisco, As’ad AbuKhalil, professor of Middle East politics at California State University. Also joining us, from Washington, D.C., Farid Ghadry, co- founder of the Reform Party of Syria, an organization that also follows Middle East politics. Now, before we get to our guests, let’s go to Baghdad. Our CNN’s Karl Penhaul is there. We saw the demonstrations, Karl. How representative are they of the feeling on the ground in Iraq? Do people there want direct elections? Are they unhappy with indirect elections? KARL PENHAUL, CNN CORRESPONDENT: Well, just a little word about those demonstrations today. In Basra, Hala, organizers and witnesses say tens of thousands of Shias turned out to demonstrate there. They were chanting anti-occupation slogans, as well as other slogans in support of the Grand Ayatollah Ali Al-Sistani. That said, the British military authorities, who control Basra, put the number only at a few thousand, so a little bit of a difference of the figures there. But certainly in many senses, these demonstrators are the political muscle, if you like, of the Grand Ayatollah Sistani. Over the last few days, he’s been stepping up his calls for general elections, to choose Iraq’s new leadership, the transitional government that will take over from the occupational authorities from (ph) mid-year. Now, as was already mentioned, the coalition said no, there is no time for that, no time for new electoral laws, no time for new electoral rolls. What we’ve got to do is choose new leadership through a series of regional committees, these so-called caucuses. There is another factor in the mix now, because on January the 19th, and perhaps this is why we’re seeing these demonstrations now, but on January the 19th, members of the Iraqi Governing Council, as well as coalition administrators, are due to meet Kofi Annan in New York, and the United Nations could emerge to broker some kind of compromise here. But certainly, among the Shia population, Ayatollah Sistani is their spiritual leader. He’s emerging also as this power broker. That said, I think we would be wrong to characterize the Shia block as one solid block. There are other spiritual leaders there; indeed, others far more radical than Ayatollah Sistani. GORANI: All right, Karl Penhaul there in Baghdad, giving us a picture of what it’s like on the ground, what the population of Iraq is feeling and how they view the process going forward. Let’s get to our guests for analysis now on this – on this question. And first, if we can go to San Francisco, As’ad AbuKhalil, of California State University. What is your feeling? What is your analysis of what’s going on there? Do you think that what the U.S. is proposing now is something that would work, going forward? AS’AD ABUKHALIL, CALIFORNIA STATE UNIVERSITY: Well, it would not, especially when the calendar of the U.S. plan for Iraq is determined not by the interests of the Iraqi people, but by the agenda of a president who is seeking reelection. It’s very important here that we realize that the American people and the world at large was lied to more than once by this government. At one time there were these allegations that have proven to be unfounded, about the presence of weapons of mass destruction. And now we realize that this war has been fought under all these lofty slogans of democracy and freedom for Iraqis, is also proving to be another false premise of this devastating war. The Iraqi people don’t have Saddam, don’t want Saddam, but they also don’t want Bush either. In fact, one of the most popular slogans I hear in Arabic, on the Arabic satellite stations is “no to Bush and no to Saddam.” Saddam is gone, he will never be back, because the people of Iraq will never allow him. But it is very ironic now, in the 21st century, that there are some people in the United States who are arguing that the people of Iraq, who have fought for so long to rid themselves of this brutal dictatorship, are determined by the U.S. government, single-handedly, that they are not ready for self- determination. I thought, perhaps mistakenly, that the issue of self-determination has been settled, perhaps essentially a war (ph) ago. Apparently, I am mistaken, but it is also ironic that a religious ayatollah, representing an ideology from centuries ago, is now standing for democracy, while the self- congratulating presidency of the United States, the one that screams and yells about democracy in the Middle East is the one that is deliberately obstructing democracy for the people of Iraq. GORANI: Mr. AbuKhalil, we’d like to get another point of view in, so I am going to go to Farid Ghadry there. And what we’re hearing from Mr. AbuKhalil is the U.S. doesn’t want self-determination for Iraq. But that’s not what the U.S. is saying. FARID GHADRY, REFORM PARTY OF SYRIA: No, absolutely not. I think a lot of people don’t understand the concept of building a democracy in a country. Democracy is not just about one vote, one man, electing a leader. Democracy is about empowerment, is about transparency, is about accountability. You have to build democratic institutions that would outlast people, and I think the United States, what they’re trying to do in Iraq, and rightly so, is trying to build these democratic institutions, trying to give a chance to Iraqis to actually have a democratic, vibrant and dynamic country going forward. This has nothing to do, as Mr. As’ad said, it has nothing to do with the fact that this is related to elections or is related to some kind of imposing U.S. will. All the United States is trying to do in Iraq, and rightly so, is trying to build institutions, democratic institutions. We all know that Iraq is a majority Shia, and rightly so, they should all elect and they eventually will elect majority Shia in the government. GORANI: … let me get Mr. AbuKhalil to react to that, because we’re hearing there from Mr. Ghadry it takes time to build democratic institutions. In some countries it’s taken dozens, if not hundreds of years. Why rush it now? Why not have a caucus system that gives a semi- representative government to Iraq and at least the country is sovereign? Why not? ABUKHALIL: Is it not interesting that after the collapse of the Soviet-style dictatorships in Eastern Europe, I did not hear any debate about, we should give them time before we allow them to have self- determination and democracy. We are using this argument conveniently about Iraq for good reasons. The United States is rightly worried that if we have free elections, the puppets of these parties and organizations that the United States brought in with their tanks into Iraq are very detested and unpopular with the Iraqi people. In fact, some of these figures who sit on that Governing Council used to be henchmen of Saddam’s regime, and the Iraqi people have had enough of these (UNINTELLIGIBLE), and they would like to produce their own authentic representatives. And it’s interesting that Mr. Ghadry talked about one man, one vote. (UNINTELLIGIBLE) to sound sexist, but I think the agenda for Iraq by the U.S. government and the Governing Council is a sexist agenda too, it is against the interests of the women of Iraq. There was a demonstration two days ago by the women of Iraq. They are opposing the plan that has been supported by U.S. government that they don’t replace the secular family code of Iraq with one that is representative of the sexist, sectarian agenda of the various religious (ph) parties inside the country. GORANI: All right, Farid Ghadry, this is a good point. This is not a representative government. In other words, Iraqis are getting a really rough deal out of this. They are going to have a non-representative government that is in no way selected by them directly. Why? Why is that good? GHADRY: Well, it’s not – the government that is going to be elected in Iraq today is a government that is going to be elected under the auspice of new (ph) judicial laws that will protect individuals, that will protect rights of people. It will be elected with no institutions in place that will ensure that democracy will last. And the person who will be elected today will make sure that these institutions, human rights, issues related to laws, issues related to minorities, legal rights, all will fit with his idea of governing Iraq. And that’s not the purpose of this whole thing. We’re not going to replace one dictator, take out one dictator and replace him with another. You’ve got to institute, you’ve got to build those democratic institutions. And it’s not – this is not about tricking. This is not – we – the United States wants to leave Iraq as soon as possible, and they will leave Iraq come June, because there’s, as you know, there is a lot of pressure to do that. But they’re not going to leave Iraq before they are sure that there is a democracy in Iraq, it’s a vibrant democracy that represents all the people, including women, and that will – will deliver Iraq to – will deliver a brand new Iraq that’s democratic to the Arab countries. GORANI: Here is another important question, and in a way, regardless of the process, you have a country that is 60 percent Shia. And in that country, you have spiritual leaders who are almost as powerful if not more powerful than the political leaders. How do you equate democracy and religion, when democracy in one of its cornerstones in the Western concept of it is the separation of church and state, or clerical world and the state? How do you do that? Mr. AbuKhalil, first of all. ABUKHALIL: Well, this question, of course, should have been posed to those who have been the architects of this devastating war, and it seems to me what the United States was trying to do in Iraq in what it has done in many places in the Middle East. That in Syria in 1949, in Iran in 1953. The United States is not really concerned about the violation of human rights, which go on unabated in many of America’s – among many of America’s friends in the Middle East, especially among those polygamous (UNINTELLIGIBLE) kings of the Gulf region. They violate human rights in Saudi Arabia and elsewhere, and the United States is not concerned about that, nor is it concerned about the violation of Palestinian human rights. The only concern is whoever does the violation of human rights should be subservient to U.S. interests. And what presents (ph) in Iraq today, under U.S. military and political auspices, make no mistake about it, is an arrangement that violates the rights of Iraqi people, and human rights organizations, Human Rights Watch, Amnesty International, have documented that extensively. And whether the Iraq of the future is going to have more representation of religious leaders is because the United States invasion, the way the regime change has occurred, was done from the outside and it has unleashed some forces, many of which are reactionary religious forces that could replace one dictatorship with another. GORANI: All right, let’s get Mr. Ghadry on that. What is your reaction to that? This is — basically, it sounds like the U.S., according to some, in the view of the what United States is doing in Iraq, is only to serve its own best interests. They’re not in it for the democratic revolution in Iraq. That’s what some are saying. Your reaction to that? And what can you put forward, in your opinion, to support the view that the United States (UNINTELLIGIBLE) make that country democratic and free and then leave? GORANI: OK. Quickly, gentlemen, I need to wrap it up, so I am going to have both of you answer this one last question. Iraq in 12 months time, what would it be like? Fifteen seconds each, if you could, Mr. AbuKhalil first. ABUKHALIL: I say it’s going to be a bloody mess of the making of the United States, and I think what the United States is doing in Iraq not only is harming the interests of the Iraqi people, who did not attack us on September 11, they had nothing to do with it, and it’s going to be also making the region and the world at large not only less safe, but also more haven for terrorists, from throughout the region, and the cause of democracy has been harmed by U.S. actions in Iraq and elsewhere. GORANI: OK, thanks, Mr. AbuKhalil. A very bleak, bleak view of the future. Mr. Ghadry, more of a U.S. supporter, where do you see Iraq in 12 months? 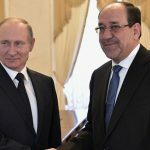 GORANI: And who leading Iraq also? Who will be leading Iraq? GHADRY: I think there will be a Shiite leader leading Iraq, as the majority is Shiite, but I truly believe that Iraq will be on its way to becoming a vibrant democracy. I think all the problems we’ve had for the last month in going forward they’re going to be resolved. The United States will be able to use the tools of diplomacy on its hands to convince all the parties to build democratic institutions in Iraq, and to move forward towards a much better place, and a full, vibrant democracy in that country. GORANI: All right, two views at the opposite ends of the spectrum. Maybe it will be somewhere in the middle, maybe one of you will be closer to being right. We’ll have to wait and see in 12 months’ time. Many thanks, Farid Ghadry for joining us, from the Reform Party of Syria, joining us from Washington, D.C.
GORANI: And from San Francisco, As’ad AbuKhalil, of California State University. Many thanks, gentlemen, for your time and your analysis. And that is this edition of Q&A. We always want to hear from you. Send e-mails at Q&[email protected] for your views and comments. And we’ll have more news in a moment. You’re watching CNN. Please stay with us.